U.S. Customs and Border Protection officers at the ports of Los Angeles and Long Beach seized five cars last month, including a 1967 Jaguar XKE stolen in New York City 46 years ago. After 46 years, Ivan Schneider's prized possession, a 1967 convertible Jaguar XKE, is returning to its rightful owner. Schneider was 36 and a young New York trial attorney when he bought the brand new 1967 convertible Jaguar for $5,000 as a treat to himself for winning a big case. He had it less than a year when it was stolen during the middle of the night from outside his Manhattan apartment in March 1968. "I went downstairs and it was gone. I walked up and down Madison Avenue, then up and down 5th Avenue, and it wasn't there," Schneider said. "I was devastated." Schneider thought his prized possession was gone forever. That is, until officials recovered it this year during a routine inspection on the West Coast. "I would tell stories about this great car that got stolen, I bought a Corvette after it was taken," Schneider said. "I have had a lot of great cars since then, but none has been as pretty." 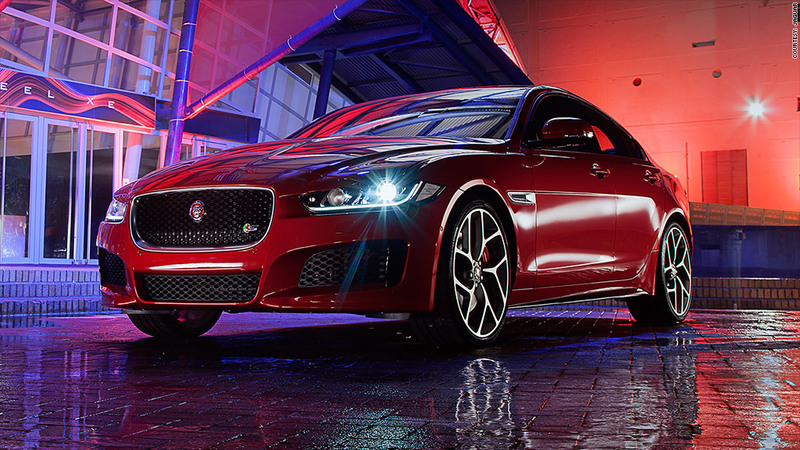 Last month, the U.S. Customs and Border Protection and other law enforcement agencies recovered the Jaguar and seized four other stolen automobiles after they passed through the Los Angeles and Long Beach, California, port complex. 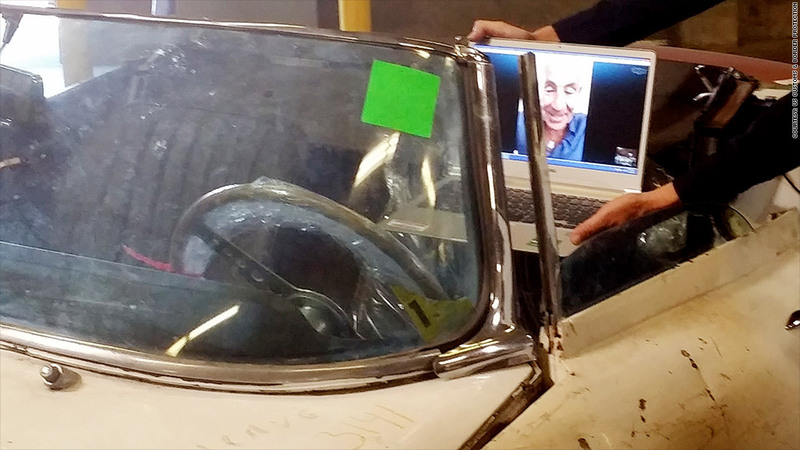 Ivan Schneider, 82, gets to peek at his 1967 Jaguar XKE, which he last saw in 1968. So much time has passed since the car was stolen that, much like its original owner who is now 82 years old and living in Miami Beach, Florida, the car has aged. Its bullet gray paint job has now faded to near white. 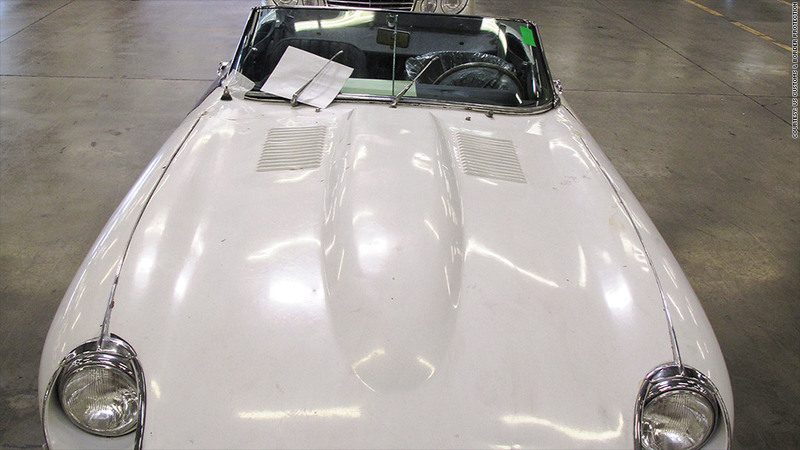 The two-door 1967 Jaguar XKE convertible was discovered in a container that was going to the Netherlands, authorities said. They checked the vehicle identification number, which is standard operating procedure for cars being shipped out of the U.S., and when authorities identified it as stolen, they directed the carrier already in route with the Jaguar to turn around. Schneider was in disbelief when he got the call that his Jag had been recovered after all these decades. "I thought they were kidding me, who would think a car would show up 45 years later. When I found out they weren't, I was thrilled," he said. The Los Angeles and Long beach ports are the busiest shipping complex in the United States, and custom officials there recover about 250 stolen vehicles per year, according to Larios. The Jaguar has certainly lost some of its luster since its owner last saw it: The sports car is rusty and scratched and has a mismatched brown door. In its present condition, it's worth about $23,000. If it were in pristine condition, it could fetch $100,000, according to federal customs estimates. Schneider says he hopes to bring the car back to its glory. "I am going to fix it up make it as good as I can," said Schneider. He estimates the restoration to cost between $50,000 and $75,000. Schneider is still waiting for word on when he will be reunited with his Jaguar, but is itching to get back behind the wheel. "I will drive it for an hour a week. I have other cars, I will use this one as a toy," he said. Schneider won't be the only one getting back his stolen car. Other recovered vehicles include a 1969 Corvette taken during a burglary in Portland 26 years ago, a 1976 Mercedes 280, a 2007 Mercedes E350, and a 2014 Camaro ZL1, officials said.